"Tensions are rising as the third book in the series kicks things up a notch!" Meg Corbyn is continuing to adjust to her life outside the confined prison where she once lived as a blood prophet, a cassandra sangue who spoke prophecy for her captors' financial benefit. Other blood prophets, now freed from the confines of their captors, are struggling even more so to survive and Meg's experiences may be their only hope for survival. Meanwhile, the tensions between the terra indigene (also known as the earth natives or the Others) and the humans is ramping up in intensity. Simon Wolfgard's Lakeside Courtyard is one of the few places where humans and the Others regularly and safely interact... but will this be enough with prejudice and fear on the rise? 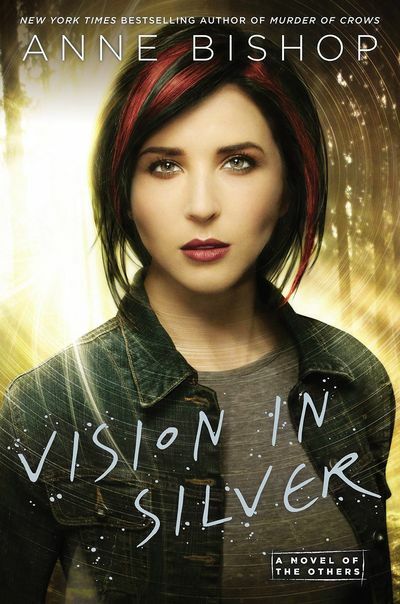 A VISION IN SILVER is the third book in Anne Bishops The Others series and is best appreciated in the context of the series as a whole. Anne Bishop is continuing to expand the parameters of the world as we learn more about the various cultures and factions that exist on Thaisia. Relationships are changing as the world politics are growing testier. The Others series is perhaps one of the best series in its genre and I can't imagine why anyone wouldn't want to read all three of the books in the series! Anne Bishop's world building is second to none as she is simply a master at crafting this dark, world where humans are the prey and not the predator. The tension in VISION IN SILVER is palpable as it practically seeps through the pages and I couldn't turn them fast enough to see what would happen next. I can't rave enough about this series as I almost hate finishing each new book since it means that I have to wait for the next one to be published. A VISION IN SILVER steeps the reader deeply in the prejudices that underlie the various factions of the humans and the Others while still showing us that some common ground can be found- if only the parties are willing to try. I love that Anne Bishop doesn't soften her characters but rather lets us see just how far the gap between the two species really is- and just how scary a clash between them could be. If you love dark fantasy, urban fantasy, or just excellent writing and world building, then don't hesitate to read Anne Bishop's The Others series and A VISION IN SILVER. The Others series is one of my favorites and I can't recommend it highly enough! The Others freed the cassandra sangue to protect the blood prophets from exploitation, not realizing their actions would have dire consequences. Now the fragile seers are in greater danger than ever before�both from their own weaknesses and from those who seek to control their divinations for wicked purposes. In desperate need of answers, Simon Wolfgard, a shape-shifter leader among the Others, has no choice but to enlist blood prophet Meg Corbyn�s help, regardless of the risks she faces by aiding him. Meg is still deep in the throes of her addiction to the euphoria she feels when she cuts and speaks prophecy. She knows each slice of her blade tempts death. But Others and humans alike need answers, and her visions may be Simon�s only hope of ending the conflict. Meg Corbyn entered the bathroom in the Human Liaison�s Office and laid out the items she�d labeled the tools of prophecy: antiseptic ointment, bandages, and the silver folding razor decorated with pretty leaves and flowers on one side of the handle. On the other side of the handle, engraved in plain lettering, was the designation cs759. For twenty-four years, that designation had been the closest thing she�d had to a name. She had a name now and a real apartment instead of a sterile cell. In the compound where she had been raised and trained . . . and used . . . she�d had one friend: Jean, the girl who wouldn�t allow anyone to forget that she�d once had a home and a family outside the compound�the girl who had helped Meg escape. Now Meg had many friends, and it didn�t matter to her that most of them weren�t human. The terra indigene had given her a chance to have a life, were helping her find ways to live with the addiction that would eventually kill her. But Simon Wolfgard, leader of the Lakeside Courtyard, insisted he�d seen someone like her who had survived long enough to become an old woman. She wanted to believe that was possible. She hoped this morning�s experiment might provide a clue to how it was possible. After checking to make sure she hadn�t forgotten anything they would need, Meg sat on the closed toilet seat and waited for Merri Lee, the human friend who was learning to work as her listener and interpreter. The cassandra sangue saw prophecies when their skin was cut. They were trained to describe the visions and images. But the girls weren�t taught how to interpret what they saw. That would have been pointless. The moment a girl began to speak, a euphoria filled her, veiling her mind and protecting her from what those images revealed. In fact, the only way a blood prophet could remember what she saw was to keep silent. If she didn�t say the words out loud, she remembered what she saw. It took a particular kind of courage to acknowledge that she couldn�t completely escape the addiction after so many years of being cut on a regular schedule for someone else�s profit. The prophecies inside her would not be denied. Whether she wanted to or not, Meg needed to cut. That was the reason today�s appointment with the razor was so important. She wasn�t experiencing the pins-and-needles feeling that indicated something was going to happen. Nothing pushed at her, and that made this morning the perfect time to discover what happened when she made a controlled cut. �But if this doesn�t work, if we don�t get anything useful, then you�ve made the cut for nothing,� Merri Lee argued. �Yes.� Opening the silver razor, Meg laid the blade flat against her skin, its one-quarter-inch width providing the perfect distance between cuts�the distance that kept prophecies separated without wasting valuable skin. She lined up the back of the blade with the last scar on her left forearm. Then she turned her hand and cut just deeply enough for blood to flow freely and, equally important, for the cut to leave a scar. Agony filled her, the prelude to prophecy. Hearing someone crying�someone no one else could hear�Meg gritted her teeth, set the razor aside, and positioned her arm to rest in the bathroom sink. Then she gave Merri Lee a sharp nod. She didn�t know how long she floated on the pleasure produced by the euphoria. Sometimes it seemed to fade within moments of identifying the last image, while at other times she drifted for a while in a haze of physical pleasure. When she became aware of her surroundings again, Meg realized enough time had passed that Merri Lee had bandaged the cut, cleaned the razor, and washed the sink. The blood of the cassandra sangue was dangerous to humans and Others alike. It had been used to make gone over wolf and feel-good, two drugs that had caused so much trouble throughout Thaisia in the past few months. That was the reason why, when they made plans for this cut, she and Merri Lee agreed that all the blood would be washed away, and the bandages would be collected later and taken to the Courtyard�s Utilities Complex for incineration. �Did it work?� Meg asked. �Did I speak prophecy? Did I see anything useful?� Her voice sounded rough, and her throat hurt. She wanted to ask Merri Lee for a glass of water or maybe some juice, but she couldn�t rouse herself enough to say anything more. �I didn�t see anything bad happening to Sam? Or Simon? Or . . . anyone here?� In human form, Sam Wolfgard looked to be around eight or nine years old now, but he was still a puppy. And Simon was her friend. Just the thought of something happening to either of them made her chest hurt. Meg followed Merri Lee out of the bathroom, feeling a little lightheaded. Yes, she needed to eat, needed a little quiet time. Needed to figure out what to say to whichever Wolf had guard duty today. Even if she tried to avoid him, the Wolf would smell the blood and ointment. She was pretty sure she could talk John into not sounding an alarm, and if it was Skippy�s turn as watch Wolf, a couple of cookies would distract him. On the other hand, if Blair, the Courtyard�s primary enforcer, showed up with Skippy, as he usually did . . . Maybe Merri Lee was right about telling Vlad before someone started howling about the cut and brought everyone running to demand answers. She could select one of the CDs she�d borrowed from Music and Movies and listen to music while she ate. Or she could look at one of the magazines she was using to provide herself with images for the prophecies. But she didn�t want new sounds or new images right now. She wanted to know what she had seen. She wanted to help figure out what the images meant. And even though her friend had tried to be reassuring, Meg wanted to know what she�d seen that Merri Lee didn�t want to talk about. ? Vladimir Sanguinati, co-manager of Howling Good Reads, settled behind the desk in the bookstore�s office. Turning on the computer, he ignored the scant stack of paperwork and wrote a quick e-mail to Stavros Sanguinati, who lived in Toland, the big East Coast city where the largest book publishers were located. Human book publishers, that is. Since the shakeup in the Midwest Region a couple of weeks ago, shipments of all kinds of material had slowed down, whether those materials came from the Midwest or not. So it was possible that the human publishers really were out of so many of the books he�d ordered for the store and were waiting for the next shipment of paper in order to print copies of backlist books and new titles. Or they could foolishly be out of stock only for orders sent in by the terra indigene. Stavros would find out. Like Grandfather Erebus, he enjoyed old movies and often played at being a caricature of his own kind, the country vampire wearing blue jeans, a plaid shirt, and work boots who said things like, �Ve vant a six- pack of blood.� But when he was on official business for the Toland Courtyard, Stavros followed the Sanguinati tradition of wearing black, and there was nothing countrified about him when he arrived in a limousine, dressed in a suit of the finest material. Stavros was euphemistically called the Toland Courtyard�s problem solver. Knowing how the other vampire solved problems, Vlad could almost pity any human who received an official visit. So Stavros would encourage businesses to put stores like Howling Good Reads first when they were filling backorders, and Vlad would be able to fill the requests coming in from the terra indigene settlements that received goods from the Lakeside Courtyard. The goods manufactured by humans were the only reason the terra indigene on the continent of Thaisia tolerated the continued existence of those invasive monkeys. If goods were no longer supplied, humans had value as only one thing: meat. As Vlad sent the e-mail, he heard someone coming up the stairs. Hesitant footsteps but not furtive ones. Could be someone in the human pack wanting to use the computer in the Business Association�s room, which took up the other half of HGR�s second floor. They were supposed to ask permission before going into that room, and the newer employees were still getting used to working for, and dealing directly with, the Others. That could explain the hesitation. When Merri Lee stopped in the doorway and he saw the look on her face, Vlad understood that the hesitation he�d heard was because she knew he wasn�t going to like whatever she had come to tell him. He closed the e-mail program and waited to see what the exploding fluffball wanted. When Howling Good Reads had been open to human customers, he�d heard human females refer to him as �eye candy,� which meant his dark hair and eyes, his olive skin, and his handsome face easily attracted his prey. For him, feeding was often combined with foreplay. But Merri Lee had never shown any sexual interest in him, which proved she was more sensible than other human females, and since she was dating a police officer, he didn�t think she was about to throw herself at him now. Which meant he really wasn�t going to like her reason for coming up here to find him. �Is there something I can do for you, Ms. Lee?� he finally asked when she continued to hover in the doorway. She rushed in and sat in the visitor�s chair. It occurred to him that he didn�t know who was supposed to be on duty today. Nathan Wolfgard, one of the Courtyard�s best enforcers, was usually the Wolf on guard when Meg was working in the Human Liaison�s Office. But Nathan was on leave for a couple more weeks, running with the Wolves in the Addirondak Mountains, free to shed his responsibilities along with the human skin. The Sanguinati were more at home in human cities since smoke, their other form, made them ideal predators in an urban environment. But shifters like the Wolves, Bears, and various feline gards found life in a Courtyard a constant strain. Working in a Courtyard was a sacrifice some terra indigene made for the benefit of the rest of their kind. They kept watch over the two- legged predators who had come to Thaisia from other parts of the world. They made it possible for humans to exist on this continent. Vlad wondered if any humans realized that�or realized what happened to the places granted to humans when a �civilized� place like a Courtyard disappeared. But those thoughts weren�t important right now, not with this female staring at him from the other side of the desk. �What will upset the Wolf?� he asked, having an uneasy feeling that he already knew the answer. Vlad�s hands closed into fists, but he stayed seated. A thousand cuts. Supposedly that�s all a cassandra sangue could make before the cut that would kill her or drive her insane. And it wasn�t just the cuts made with a razor. Any injury that broke skin counted as part of that number. Most of those girls wouldn�t see their thirty-fifth birthday, and here was Meg cutting without a reason. Addiction was its own reason. That would explain why Meg had chosen a time when Simon Wolfgard and Henry Beargard were away from the Courtyard. But that didn�t explain Merri Lee coming to see him. Merri Lee nodded. �It was different from the last time I assisted. After the initial . . . discomfort . . . Meg began speaking. Lots of images. I think she heard some things too, but the sounds were part of the images. I wrote them down.� She handed him a sheet of paper. Vlad studied the long list. �What does that mean?� He pointed to a P in parentheses after some of the words. �It�s a pause,� Merri Lee said. �That was different from the last time. This time Meg paused, like a rest in music, so I thought each group of words made up a picture.� She handed him index cards. Vlad looked at the �stories� on the index cards and felt chilled. Some of the �stories� meant nothing to him. But if he was interpreting others correctly, all of the terra indigene would need to act swiftly. Vlad studied Merri Lee. Some of the �stories� meant nothing to him, but they did mean something to her. �Which ones do you understand?� He placed the index cards on the edge of the desk where she could reach them. �I see.� And he did see. Label anyone who wanted to keep peace between humans and the terra indigene as a Wolf lover, especially if that person directly interacted with the Others in any capacity, and force those people to choose between having a job and feeding their families, and opposing the fools who would provoke a fight that would end with many, many humans dead or driven out of the city. Merri Lee didn�t answer him, and that was answer enough. �Say it anyway,� he suggested. At least Merri Lee, all fired up now in defense of her friends, was acting more like her usual self rather than a flinching bunny. She was telling him about Ruthie and Kowalski, but she was also revealing what she and Michael Debany were facing. Debany was another police officer who dealt with the Others, and Merri Lee worked for the Courtyard. Right now, she lived in one of the efficiency apartments above the seamstress/tailor�s shop, but sooner or later, she and Debany would want to live together as a mated pair and would face the same hostility. �Anything else?� he asked. She�d already given him plenty to think about, but he sensed the girl wasn�t finished. �Trouble� might be a small word for what could be happening to those girls. Didn�t humans realize the terra indigene had heard such words before? Didn�t humans understand that such words were a warning that a fight for territory was building under the surface? Didn�t they wonder what had happened to cities, and civilizations, the previous times humans had made such claims? Fine, Vlad thought. Let it come. You monkeys have no idea what�s out there in the wild country. But you�ll find out. If you start a fight with the Others in Thaisia, you will find out. Can�t wait to discuss this with Simon, he thought as he returned to the desk and sent a quick e-mail to all the Sanguinati living in Thaisia. What Meg saw is already in motion, which means the blood prophets, the sweet blood, are already in danger.